The Sun Pokémon Espeon is a loyal friend for any trainer- and Espeon-GX brings the powerful Psybeam and Divide-GX attacks to your game! 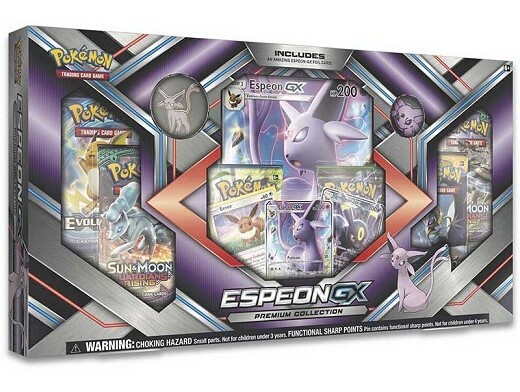 This collection brings you Espeon-GX as a foil promo and oversize card, pin, and coind, along with foil cards featuring Eevee and Umbreon-GX. Light a path to victory with the power of Espeon-GX! 3 foil promo cards featuring Espeon-GX, Umbreon-GX, and Eevee!